Well, the news is still settling in, but I guess there is no denying it now: Tim Tebow is engaged. When I posted about this on facebook, one of my friends said, “Nothing is final until you’re dead.” And while I appreciate that sentiment, I think it’s safe to say that Tebow and I are probably not going to be a thing at this point. A friend sent me a Babylon Bee article about both Tebow and Chris Pratt being off the market in the same week, and it hit a little too close to home with its satirical interview. “If I couldn’t land a Christian football star or an A-list Hollywood actor,” laments the single Christian girl in question, “then is there really going to be any guy out there for me? I’m just not sure there are many other choices that God would have for me.” Words I may or may not have spoken at some point. The article goes on to say that at time of publication, this girl was “googling ‘single Christian celebrities’ to try to replenish her list of men she suspects God has destined her to be with.” Something I may or may not have done. While my crush had significantly subsided in recent years (due, in large part, to the realization that he’s not into blondes), at other times in my life I was honestly pretty convinced that some way, somehow, Timmy and I were going to end up together. I intentionally didn’t read his book for a long time so that if I ever did meet him, I wouldn’t know everything about him and could ask him questions like a normal person. Because normal people are definitely convinced they’re going to marry celebrities they’ve never met. I did TRY to meet him, though. When I lived in Virginia Beach, Tim was doing a football camp in Williamsburg, and I dragged a friend with me to see if we could find him. We could not. Another time, a friend invited me to her church in Knoxville where he was speaking. I went and intentionally wore a bright yellow dress so I’d stand out. Like a highlighter. But that didn’t work, either. Even when I went to India, I had a layover in France, and I thought I’d get to hang out in the lounge (I was wrong), and I imagined that Tebow – who would for sure have lounge access – would come in, we’d strike up a conversation, I’d tell him I was returning from a mission trip, and he’d propose on the spot. Or something like that. But, I was prepared for this disappointment. I had been pretty convinced another time in my life that I was going to marry a celebrity – Prince William. Princess Diana died when I was 12, and like everyone else, I was glued to the coverage – and that’s how I learned that her 15 year old son existed. And like the 12 year old that I was, I fell hard. I bought every magazine about Diana in print and plastered my 7th grade locker with William pictures. I sent a cassette tape to the princes that I thought would encourage them after their mom’s passing (this was half well-intentioned sweetness, and half because I thought he’d listen to it and just have to know the American girl who sent it – and to know me is to love me). And when one of my friends said she really thought I’d end up with him, I took it as a word from the Lord. This was also middle school, so I took license plates with my crush’s birthday numerals on them as signs from above. Alas, Wills is 3 kids in at this point, and Tebow bought his fiancée a rock the size of Texas. But, I don’t regret my day dreams. Being a romantic makes life more rosy and interesting. Sure, following Tim across the country wasn’t the most productive use of my time, but I had some fun adventures with friends and got some good stories along the way. And perhaps my friend was a little off in her forecasting about my future royal wedding, but if 7th graders can’t have wild dreams about the future, who can? So, I wish Timmy the best, and I will continue to live vicariously through Kate and Megan and all those who wear a crown, because, well, my name literally means princess, so I can’t help it. But, I won’t start googling Christian celebrities again, just yet. I don’t have a good tie-in for this outfit. I just liked it. I actually wore this dress to work last week. I know it’s really too fancy for the office, but I’ve been watching a lot of Suits, and Donna inspires me with her fashion choices, as inappropriate for the workplace as some of them may be. And, I put a sweater over it, so that definitely toned it down. So, friends, I told you my embarrassing stories – what about you? Have you ever been CONVINCED you were going to marry someone famous? Who was it, and what measures did you take to make this happen? Please share so we can all reminisce about famous loves gone-by. I bet some names might pop up more than once. Can I complain for a moment about Nashville? Yes, I’ve sung its praises ad nauseam for the past year, but I do have one bone to pick with the perfect city, and I really am feeling my grievances strongly today. Okay, so obviously this is not a REAL complaint. But, honestly, if I were to do everything in this city that I want to do, I wouldn’t ever sleep. Which might be part of the reason I have gotten sick several times…moderation is not one of my greatest strengths. Last night, for example, was the CMA Awards. The 50th CMAs. It’s a concert I would have loved to see live, and all of the social media posts about it made my already pretty severe FOMO sky-rocket. Plus, Beyonce was there. When am I ever going to be in Beyonce’s presence another time? I’ll tell you. Never. Unfortunately, while the CMAs typically need seat fillers, an opportunity I frequently take advantage of, because this was the 50th anniversary, they needed very few extras, and only people who had gone to other smaller events throughout the year were eligible. Why hadn’t I gone to smaller events throughout the year, you may ask? Please see the 2nd paragraph. I just can’t fit it all in, and it makes me sad. Things I have missed this week: a free Chris Janson concert, two free Dierks Bentley concerts, a Halloween party actually on Halloween – and probably many others. So, there you have it: probably the most first-world problem of all first-world problems. I feel better having ranted about it, though, so thank you for indulging me. And here is an outfit I wore as a seat-filler to the CMT Artists of the Year show a couple weeks ago, where I was mere feet away from Carrie Underwood, in all of her sequined glory. Forgive the unflattering bathroom selfie, but it was the best I could do and leave on-time from work. The seat-filler dress requirements are pretty strict, and I don’t have a lot that fits the not-sequined, non-bright colors, non-white bill. But, I got a couple complements on my old faithful satin skirt, that I made look like an intentional outfit with my black shirt by adding a semi-blingy belt. I know y’all don’t feel sorry for me for missing the CMAs, but let’s talk about concerts. What’s the best one you’ve been to? Have you ever been to an awards show? If so, which one – and more importantly, what did you wear?? Y’all, I’m struggling with my blog this year. For one thing, I have three jobs at the moment, which means my free time is super limited. When that happens, my blog begins to feel like more of a chore that I have to squeeze in than something fun, and I don’t want that to happen. And, I don’t really like my hair right now. I can’t figure out my bangs situation – someone good with hair give me advice on bangs in 2016. With that, here is a favorite outfit from sometime before I even moved to Nashville. I don’t remember now why I needed to change my shoes, except that I wanted to transition from day to night, and this was my way of doing it. Also, I’m counting this as a twofer Tuesday. Hope you all are doing well. Give me your thoughts on my hair dilemma, Grammy’s fashion, or whatever else you want to talk about. Let’s get this party started again! Having said that, there are several things I’d like to mention about this look. 1) Yes, I did think I was cool wearing my fake Ray-Bans that I bought in India. 2) No, I don’t think my massive earrings combined with my massive Indian bangles were too much. 3) I love my word rings – “love” and “hope”. I don’t know why jewelry that spells things is so cool to me, but it is. 4) My hair is awesome. I don’t know if I’ll ever be able to recreate it – hopefully I can better perfect it. But, a French braid is about the only cool thing I know how to do with my hair, so I’m determined to master this upside-down one I keep seeing in fashion mags. I’m sure you’ve all seen those body-image things floating around Facebook. From Colbie Caillat’s new music video to the Dove campaign, celebrities and companies alike are really jumping on the “be beautiful as you are” bandwagon. And, it’s a good bandwagon, so I thought I’d jump on, too. Below are two images of me. The one on the right is airbrushed. The one on the left is not. I know absolutely nothing about Photoshop, and you should see even my creations in Microsoft Paint (I do not have a steady hand). And yet, with no experience and a cool program (PicMonkey), I was able to make myself thinner, tanner, blemish free, and with more color on my lips. Seriously, if I can do that in about 10 minutes, what can the professionals do in the same amount of time or longer? Very little that we see in the media (published or social) is as it really is, so to compare ourselves to others is just silly. Personal growth is great. Improve yourself if you want, whatever that means for you, but do it for yourself – not to live up to some false ideal. Figure out who God made YOU to be, and be the best of that person that you can be. Have a good weekend, everyone. And if you do something uniquely YOU this weekend, tell me about it! Let’s all celebrate being our selves! I know today is Wednesday, so it should be an inspired look, but let’s not get caught up on technicalities. I’m really just impressed with myself for blogging while I’m on the road at all. I am planning a post in the next few days in which I show you my massive efforts at consolidation and organization on this long work trip. 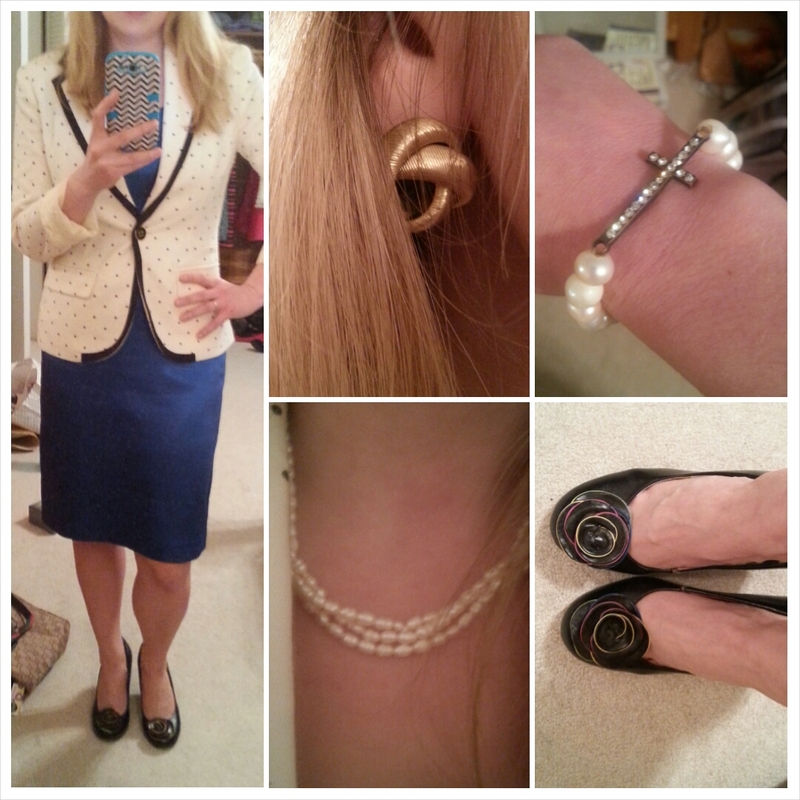 Until then, I’ll be showing you some outfits I wore previously. I LOVED this look from last week. 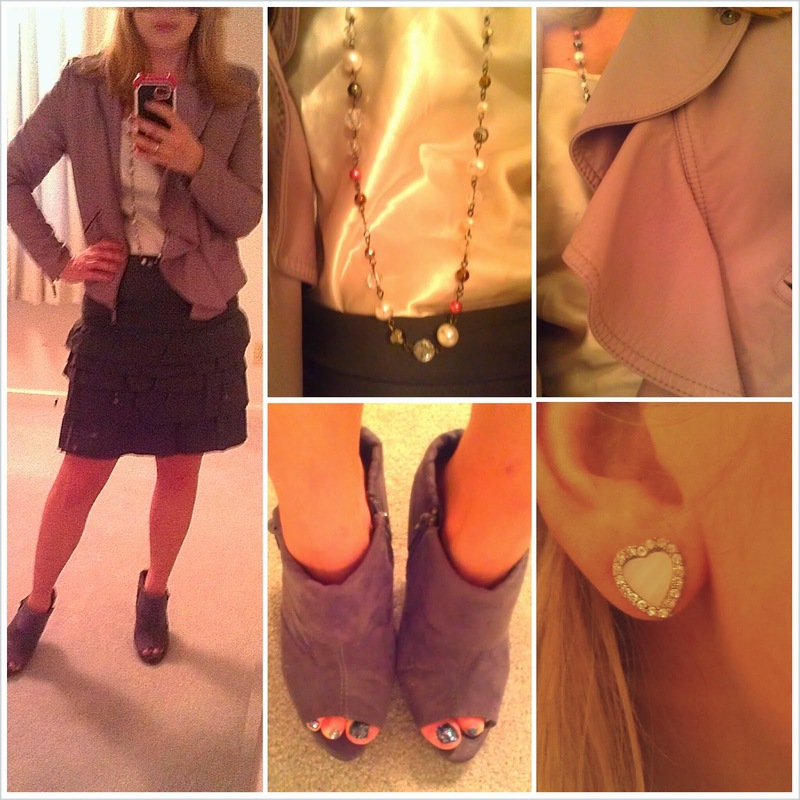 It’s not really a typical Sarah Beth look; a little more tough than I usually am (I say that about an outfit comprised of both a lavender ruffled jacket and a ruffled skirt). But, the army green of the skirt (trust me, that’s what that color is), combined with the leather of the jacket, combined with the booties, gives this outfit a little edge that was a fun change from my usual cardigans (by the way…I’m getting quite tired of cardigans. Perfectly timed for winter when I will wear them every day.). Sometimes, fashion is the most fun when you step outside of the mold of what you usually wear. Be bold, and join me in wearing something uncharacteristic – and then leave me a note and tell me about it! This is an outfit that I really loved. 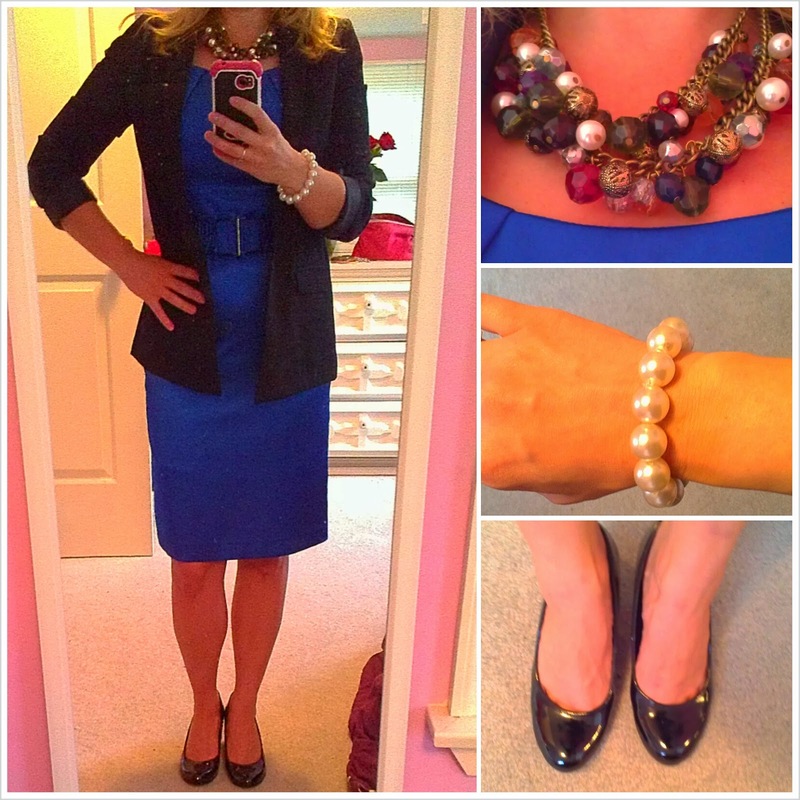 Shiny dress, shiny shoes, pretty necklace…really, what’s not to love? A satin dress is hard to pull off professionally. Don’t get me wrong, I’ve done it before – well, at least attempted. But, the blazer makes it much more business appro. I kept my accessories rather simple – a statement necklace and a pearl bracelet; no earrings or rings because I wanted the dress and necklace to do the hard work. Patent leather with satin could be overkill, but since the shoes are black, the two shines subtly work together instead of in competition. I’m also happy with this look because satin is rather unforgiving, but the long open blazer hides a multitude of sins. Hallelujah! I’d love to hear about one of your favorite looks – what do you love about it?